CAADRIA 2016 Parametric Wall Workshop – ixd! Thank you to the organisers of this fantastic workshop!! The workshop was designed and held by Paul Loh (UoM), David Leggett & Tim Cameron at their Power to Make facilities in Melbourne. Participants worked together preparing and shaping recycled felt panels according to the parametric design of the workshop leaders. 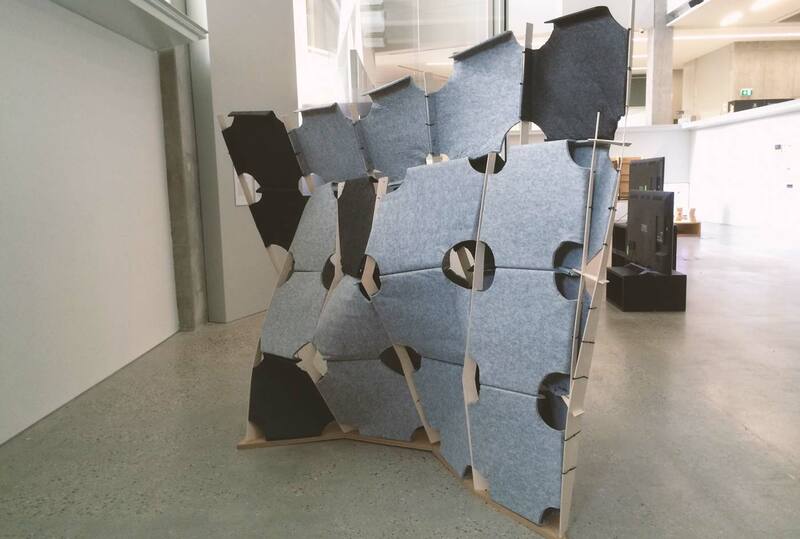 This workshop explored smart fabrication techniques through 1:1 prototype of a lightweight wall system. Working within the constraint of 16 hours to fabricate and install a system, the aim of the workshop was to demonstrate that the manufacturing of complex double curve geometry can be resolved through parallel computation geometry as well as thinking through smart manufacturing processes. The outcome of the workshop was to fabricate a wall made entirely out of EchoPanel (recycled PET). Participants manipulated panels through thermoforming procedure using a smart parametric mould system which was developed by Power to Make. The parametric mould allows for variation of double curved geometry in the z direction as well as variable edge frame condition. This workshop was run by Paul Loh (UoM), David Leggett & Tim Cameron (Power to Make).